Since sharing videos of ourselves demonstrating drills/applications is becoming more popular here, I thought I would go ahead and share an application that I developed for the beginning of Chinto. Some of you who frequent other forums may have seen me post it before, but I figured I might as well share it here anyway. I have gotten some feedback since I filmed this, and have made some changes accordingly--if I had more people my size (I'm taller than most people in my dojo, and when I am not taller than them I am usually about 50lbs lighter) that were willing to drill with me, I would have a much more solid drill for this. As it stands, though, I was showing this application to my partner for the very first time when this was recorded, so he had no idea what to do or expect and I tend to speak a little incoherently when I don't have something planned out to say. I recognized the arm lock as one that I learned in judo (ude-gatame) but from a position I actually saw in Siamese temple carvings. From there it was just a matter of linking the hammerfist and hook punch together to become the throw, and the kick was fairly obvious. The initial attack--a body lock, most likely with the intent to throw--is one that I have had critcized as being unrealistic, which is fair, but with the popularity of MMA and wrestling I really don't think it is as far-fetched as people seem to think. The idea of a body lock takedown being the initial attack actually came to me from the Chinto legend--the idea that a law enforcement official was sent to apprehend a thief, and subsequently faught that thief to a draw and asked to learn from him. I have seen videos of police officers doing body lock takedowns to apprehend criminals that try to run away from them but don't get far enough for the criminal and officer to gain momentum, so why would Matsumura not have done the same? And if he did, this application could have been the first one he learned from Chinto, which would explain it being at the beginning of the kata. That's all just my own theory, of course, and I could be completely incorrect, but that was my thought process, regardless :P.
In any case, I am not as experienced a practitioner as most (if not all) of the members of this forum, and developing application is something I have only been doing seriously for about a year to a year-and-a-half, so this could be terrible. I'm interested in feedback, of course, and if this gives anybody ideas for applications of their own then hooray! Thank you for adding this and for sharing your thinking around the application too. I really like this sharing of applications via video and the more people start doing it the better it will be for the collective knowledge pool! Thanks! good for you on sharing your idea. The scenario may not be THE most likely but it certainly is possible, and your thinking supports your idea. As for the partners you drill your ideas with I would suggest that your best bet would be to find as many different heights/weights as you can. The traditional idea of partnering someone of a similar height or weight to practice drills is dubious, it presumes that in a ''real'' situation you would only be applying the drill on someone with whom you are evenly matched. Hope that idea will be of use to you. A tip is to let the attcker respond a little more naturally, an example would be as you drop they will let go or perhaps tighten up - or go to regrip, then work with their reaction. I thought it was very good, and good on you for posting it. My only question is do you think this is an application that would require you to need Judo/Jujustu as pretty much a primary skillset? Particularly the use of the ude garame to set up the Osoto Gari seems pretty "advanced" -to me in terms of grappling skill, If those are not your primary skillset, why not just turn around and hit him once there is space? I figure most Karateka would be better at that. Not saying the other stuff isn't in Karate as i'm sure we all agree it is to some degree, but out of curiosity do you also have a simpler version of the application? The story of Chinto kata’s creation is that Matsumura had been sent to deal with a Chinese shipwrecked sailor – named “Chinto” – who was stealing food from the locals. A fight ensues during which Matsumura finds himself impressed by the sailor’s fighting skills and hence Matuamura makes him a deal: he will look after Chinto and ensure he can return home in return for instruction in his methodology. The deal is accepted and Matsumura subsequently created Chinto kata to encapsulate what he has been taught. Matsumura was of course an incredibly skilled martial artist. So skilled in fact that he was employed as a bodyguard by three Okinawan kings. He’s therefore more likely to have been intrigued by the unusual things that Chinto did as opposed to any thing basic with which he would undoubtedly already be familiar. I’ve therefore tended to see Chinto kata as a record of the “unusual methods of Chinto” as opposed to a record of “meat and potatoes” combative methods. The “feel” of the kata and my own analysis of its bunkai tend to support this hypothesis in my experience too. Matsumura also taught Itosu. And I presume it was from Matsumura that Itosu learnt Chinto kata. The kata certainly seems to have been an influence on Itosu’s Pinan (Heian) series. Notably this influence can be seen most strongly in Pinan / Heian Godan. Being the last kata of the series, Pinan Godan obviously builds on the lessons learnt by the four proceeding kata. Chinto’s influence on the most advanced Pinan would again support the notion that the kata is unusual in that is a kata all about the advanced / unusual. 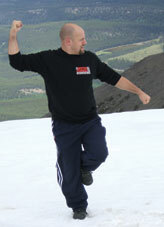 There are a few bunkai examples in the article along with a hypothesis about the “jumping kick”. Zach’s point is valid as there are simpler ways to follow up. However, to my way of thinking, this is not a kata about the simple. The intention of Matsumura could have been that we learn the basics and ensure we have them down (through other kata), then progress to unusual aspects of the methodology of the sailor Chinto? Personally, I would generally discount the complex when it comes to bunkai as simple and direct are always the most effective. However, in this case I think there is enough historical information for us to explore the idea that the kata is a record of “unusual methods that intrigued the extremely skilled”. If we do adopt that position, then Wastelander’s application is a valid possibility against that backdrop. My own preference for the application of that sequence is not so simple either (see article linked above of the Bunkai-Jutsu 5 DVD / download). Just some of my own thoughts around the kata that I hope are of interest. A thought provoking article - thanks Iain. Your suggestion reference the throwing of Matsumura immediately made me think of what recovery skills from the ground he had to get back in the fight. Thanks for the feedback, everyone! Mark B - You have a good point with regards to using partners of similar size, but my main problem is that I feel I need to become proficient at the drill before moving on to larger opponents, and using smaller opponents makes it TOO easy so I'm kind of stuck :P. I do certainly intend to drill with people larger and stronger than me (although there are only four of them at the dojo, and only two of them are experienced karateka) but I would like to get a good feel for it on people my size first--just my own preference. shoshinkanuk - Thanks! What exactly do you mean by "string" bunkai? I get the feeling it is the use of one technique to set up another, but I feel as though that happens fairly often in kata, drills and kumite, so I may be on the wrong track as far as what you mean. Zach Zinn - Seeing as how I have a few years of judo (not what I would call "extensive experience", though) under my belt, I do believe it certainly helps with this application but I don't feel as though it is strictly necessary. The lock is present in judo, yes, but it is also present in other grappling arts from all over the world (as evidenced by the Siamese temple carving I mentioned) so that technique isn't exclusive to judo. The throw itself is actually closer to o-goshi than o-soto-gari, but I actually learned this particular throw as part of my karate training, not my judo training. I will also note that, in my head, Chinto appears to have several throwing techniques in it so the Chinto of legend could very well have been a highly skilled grappler. I completely understand the preference of turning around and striking, and that actually goes into my alternate application for the juji-uke in Chinto, somewhat, because after the spin you do the same te-uke/juji-uke you did at the beginning but then close your fists, sink down and execute two kicks. To me, it's as if you broke their grip and rather than throwing them you turn around to face them, which allows you to turn the ude-gatame (straight arm lock) into ude-garame (key lock) while the sinking tightens it, and the kicks allow you to attack their legs or knee strike them so that they can be driven to the ground. As far as having a simpler application for the beginning of Chinto, yes, I do--a few of them, actually. I can see it as defending against a wrist grab (goes back to arresting techniques from the Chinto legend) and putting your attacker in a wrist lock like nikkyo. I can also see it as dropping into an elbow-to-elbow straight arm lock off the same wrist grab, at which point the juji-uke is a separate technique completely or used to deflect a punch coming from the arm you aren't locking (if that happens you probably didn't get the lock on them succesfully) then pull it out of the way for strikes to the floating ribs and/or knee strikes, kicks to the legs or a sweep. I can also see it being a technique more reminiscent of taiji where someone throws a punch and you trap it and pull them off balance by stepping back, then the juji-uke is actually a push, deflecting them away from you. Iain - That is exactly where I was coming from with my train of thought--thanks! JWT - That's a very interesting thought! As I understand it, Matsumura traveled a lot to train in different systems and so between Okinawan tegumi, Japanese jujutsu and Chinese grappling he very well could have picked up some effective skills for getting back to the feet where he was (presumably) more comfortable. I know this armlock and similar are in other arts, what I was trying to communicate was that I think a sequence like this specifically requires a pretty skilled grappler to pull off, Naturally the techniques can 'exist' in Karate, much as punches can exist in Jujutsu...i'm just asking, do they occupy the same space? These arts may contain similar tactics, but have different strategies. To me something like this looks like the strategy of a seasoned grappler, I did not know the other info about Chinto though unitl Iain posted it (i'm a Goju guy) and that puts things in a different light, It sort of puts the kata in the same category as Sepai of Goju Ryu for me, full of 'advanced' stuff I will never be good enough to use - HA being facetious of course. P.S. the last throw still looks like an Osoto gari sans the leg reap to me. I have historical issues with Iains last post (The Matsumura Story). Asato Anko told Funakoshi Gichin in an Interview that there was a shipwrecked chinese or vietnamese (Anan). Anan is either the old name for Vietnam or a Village in Fujain Province. Does'nt matter here :o). According to Asato a bunch of Tomari martial artists learned different Kata. Gusukuma and Kinjo learned Chinto, Matsumora and Oyadomari learned Chintei, Yamazato learned Jiin and Nakazato learned Jitte. Both Funakoshi and Motobu stated that Asato followed the path of Matsumura and Itosu inherited the line of Gusukuma of Tomari. So when Gusukuma was the main teacher of Itosu and when Gusukuma learned Chinto from that shipwrecked dude it is in my eyes crystal clear were Itosu learned his Chinto from. I don't know whats the origin of that Matsumura Story Iain is posting. But I tend to believe Asato due to the fact that he is a contemporary witness. There is no Matsumura Chinto in Karate, as well as there is no Matsumura Rohai. Kata that were certainly taught by Matsumura were Matsumura Passai, Matsumura Seishan, M. no Kon, M. no Sai. He also practiced Naihanchi, Kushanku and maybe Gojushiho and maybe Channan. Could I ask what leads you to believe Matsumura taught a version of Seisan, I am aware of evidence albeit it rather unreliable stating he did and he didn't, its an area of interest for me. My source is a book by the german Karate historian Henning Wittwer. I could ask him what his source of information is. Anyway there are some logical hints too. In that Interview I mentioned above, Asato is listing some Kata. Seishan is one of them. That would mean he at least knew that it existed. His only students were Funakoshi and Oshiro Chojo. And there is an Oshiro Seishan. So it is quite obvious that he could have learned Seishan from Asato. As far as I know Asato had only Matsumura as teacher for Karate. He learned different arts from different teachers, but Matsumura was the one who taught him Karate. So that would link the Seishan directly to Matsumura. On the other hand, Itosu was not a long time student of Matsumura but the successor of Gusukuma of Tomari. Maybe that is why direct Itosu lines don't have Seishan in their curriculums. Here is another Reference to the Chinto Story. I don't know who this teacher is but I Googled the Chinto Store and this is what came up. If I find more I will post. Dom, I know that this story is fairly wide spread. But that is not the point. I'm interested in the origin of that story. So who was the first that came up with that story and what are the sources that this story is based on. Jim, I looked further into the Seishan issue. Kyan Chotoku has learned his version of Seishan from Matsumura according to his student Nakazato. Sakagami also taught a kata Matsumura Seishan. That also points in the direction that Matsumura taught Seishan. Thanks for the info - I am not so up on other Ryu history - I was aware of the Kyan link, we have some verbal evidence that Hohan Soken dropped Seisan but then (with Hohan Sokens permission) Kise reintroduced Seisan to the public Matsumura Seito curriculum. My problem is, if Hohan Soken dropped it, why get someone else to 'build' a version and reintroduce it? I also have fairly solid evidence that hohan Soken did indeed teach Seisan in Argentina before he moved back to Okinawa. I know that this story is fairly wide spread. But that is not the point. I'm interested in the origin of that story. So who was the first that came up with that story and what are the sources that this story is based on. The tale of “Chinto vs. Matsumura” is widely told and from memory it is repeated (as legend) in the works of karate historians such as Kim, McCarthy, Hokama, etc. However, as is the case with much of karate history, it is impossible to know if the legend is true, partial true, an accepted and useful myth, or entirely false. I’ve also not came across anything that gives the specific origins of the tale i.e. who first told the tale. It’s perhaps another of those “oral traditions” things in that all those who record the story in text are reporting on an oral legend with the ultimate source being unknown. What we do know is that it is a tale that is widely known but no one was there to corroborate that tale and just because it widely “known” does not mean it is true. It is therefore up to the individual whether they accept it or discount it. For my part, I’m happy to run with it on the basis of the tale being an “accepted truth” (by many) as opposed to a “proven truth”. I also feel the tale fits with the nature of the kata and therefore make for a coherent hypothesis. Historically we will never know for certain, but practically the hypothesis has legs and I’ve found viewing the kata from that perspective yields pragmatically useful applications within that supporting hypothesis. You are entirely correct that the “Chinto legend” is not undisputed historical fact though and even the orgins of the legend are unclear. Have you looked at the same shift and counter locking from a front waist lock as well? That change in angle may result in some interesting results. If I can grab a body before class tomorrow I may try it myself. I'll have to review your opening sequence a few more times though as the version of Chinto that I'm familiar with has a different opening. When looking at the Chinto kata, the oral history tie this to China directly and you have fighting techinques that stumped one of the great Okinawan karate men, pre-modern eara. I expect to see applications and fighting principles that will lie somewhat outside of the norm for other Okinawan systems/kata. While some principles are universal in combat as the human body only moves so many ways, not everything was common across all arts and regions. The first thing to catch your attention is the embusen. It's a straight line! Whether it's forward and back, or as I'm more familiar with, on a diagonal, there are no turns off the line. No "H" or "+" or any other shape where it's up and back and mirrors itself. Something else that strikes me is that it very plainly lays out simultaneous attack and defense. While bunkai bares out that there are a lot of attack/defense applications where it's defendattack not defend, attack, Chinto is one of the few I know, that is common across many systems, that openly does both at once. The caveat, of course, being I don't claim to know every kata across all systems of karate. Chinto for me is mostly untested waters as far as bunkai goes. I've looked at a few sequences, but nothing in depth. Takes a lot of courage to put yourself out there on video to a knowledgable group like this. Cheers to you Wastelander. I'm afraid I can't comment too much on the controversy regarding the Chinto origin story, as this is the first time I have ever seen any other story beyond the "shipwrecked Chinese martial artist" one. I have to say I feel rather like a fish out of water when it comes to discussing some aspects of karate history because so much of it is legend, exaggeration or hearsay and I tend to have a hard time keeping it all straight in my head and separating the wheat from the chaff. I had not looked at it that way before, but it's something I will also have to try! The lock that would result from the front is one I have used while clinching, but no other positions. Thanks for your input! M. no Kon, M. no Sai. A friend reminded me about this - could I ask where/how you came to this conclusion, and also what actual kata you are refering to? I am not into okinawan Kobudo so much. Matsumura no Kon and Matsumura no Sai were listed as Kata taught by Matsumura in the above mentioned Book. So I'll have to ask the author what his source of information is. Hallo to everbody and thank you so much, Iain, to accept me to the blog. I would like to copy/paste 4 videos showing the kata explanation and bunkai of Gankaku / Chinto. This is an old lesson (1992) held by my Sensei and Shian Hiroshi Shirai. Maybe, today his teachings are slighty diff. Anyway, I know that Iain doesn't like so much this kind of translation in the bunkai, but I kindly ask you to pay attention to the principles explained in the video. Just an example: if your bunkai for an UCHI UKE is a grab, a throw, a projection, etc. it is still valid to study the UCHI UKE as a block in order to develop skill in turning/twisting wrist, elbow, hips, etc. what are the principles explained by Shirai? Only from watching those videos I am not able to determine this. I can't really judge them because I don't know what he is explaning. When you are a student of his you might be able to explain that. From mere observation I can only tell that I see him advising his students to attack in a certain way, otherwise his explanations won't work. What is the probability that someone attacks you this way anyway? In regards to your example of Uchi Uke. I don't see any benefits to study Uchi Uke as a block. When I want to concentrate on the turning/twisting of wrist, elbow and the hips then I study the movement of Uchi Uke in isolation. Then I start to take considerations towards the "what can I do with this twisting of the wrist, elbow, hips". Sure you can use this movement for blocking when your opponent has a certain distance and when you know that he is coming in with an Oi-Zuki or Gyaku-Zuki. Dear Ky0han, thanks for your comments. By the way I take the opportunity to reply back in order to better explain my point of view. Against an Oi-Tsuzki attack, you can develop many different attitudes and skills. It is a very simple attack, this is true, but it is really powerful, and it helps a lot to study distance and timing. It's a reference point. That's it. If you train deflecting a full speed and powerful Oi-Tsuki, your body, limbs and your technique become much more powerful and efficient. After that kind of training (or in addition to that) we also spar for the street, I mean, gradully, up to a non pre-arranged sparring. So I agree with your considerations but in addition to that we found that the sudy of the basic tachnique (applied to and opponent) is really helpful. Coming back on the pre-arramged techniques... This exercise is also useful to understand turnings. In fact when we spar in freestyle, we face opponents coming from all directions and attacking (also) in non-conventional ways. After the training shown in the videos, We train the kata bunkai technique per tehcnique (also random based) only in frontal facing (also the side or rear techniques) so that turnings become projections and angles become different lines to attack or defend. Anyway, I grant you that the basic study helps us in the advanced sparring. Hallo to everybody and thank you so much, Iain, to accept me to the blog. You are very welcome! Thanks for joining and posting. I would like to copy/paste 4 videos showing the kata explanation and bunkai of Gankaku / Chinto. This is an old lesson (1992) held by my Sensei and Shian Hiroshi Shirai. I tried to embed the videos, but embedding had been disabled. People can still view them by following the links of course.